DID YOU KNOW? THERES A CRUISE THAT TAKES YOU AROUND THE WO - ProudMummy.com the Web's Community for Mums. DID YOU KNOW? THERE'S A CRUISE THAT TAKES YOU AROUND THE WORLD IN 119 DAYS. 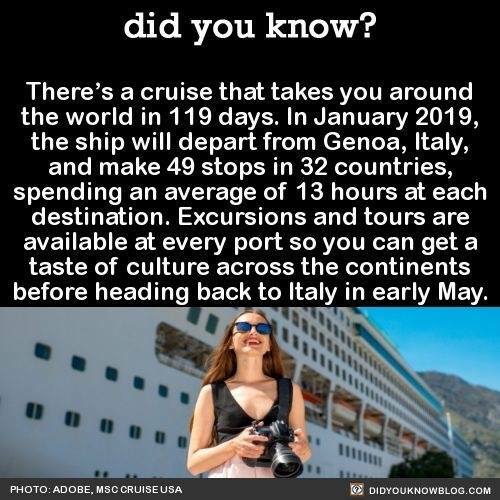 IN JANUARY 2019, THE SHIP WILL DEPART FROM GENOA, ITALY, AND MAKE 49 STOPS IN 32 COUNTRIES, SPENDING AN AVERAGE OF 13 HOURS AT EACH DESTINATION. EXCURSIONS AND TOURS ARE AVAILABLE AT EVERY PORT SO YOU CAN GET A TASTE OF CULTURE ACROSS CONTINENTS BEFORE HEADING BACK TO ITALY IN EARLY MAY.